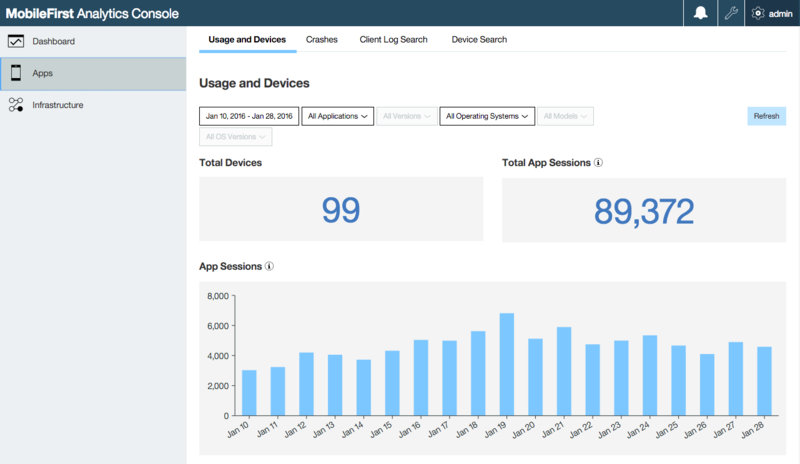 IBM MobileFirst Foundation Operational Analytics provides client-side APIs to help a user get started with collecting Analytics data about the application. This tutorial provides information on how to set up analytics support on the client application, and lists available APIs. Before you can start collecting the predefined data that MobileFirst Analytics provides, you must first import the corresponding libraries to initialize the analytics support. In Cordova applications, no setup is required and initialization is built-in. Note that you can select your own namespace to replace “ibmmfpfanalytics”. No setup required. Pre-initialized by default. Before calling other methods of the WLAnalytics class, call WLAnalytics.sharedInstance(). The Analytics API gives the developer the freedom to enable and disable collecting Analytics for the event they want to visualize on their MobileFirst Analytics Console. The MobileFirst Analytics API allows for the capturing of the following metrics. The initialization of the analytics API must be written in native code, even in Cordova apps. To capture app usage, you must register app lifecycle event listeners before the relevant event occurs and before sending the data to the server. To use the file system or native language and device features, the API must be initialized. If the API is used in a way that requires native device features (like the file system), but was not initialized, the API call fails. This behavior is especially true on Android. After the Analytics SDK is configured, app sessions start to be recorded on the user’s device. A session in MobileFirst Analytics is recorded when the app is moved from the foreground to the background, which creates a session on the Analytics Console. As soon as the device is set up to record sessions and you send your data, you can see the Analytics Console populated with data, as shown below. Enable or disable the collecting of app sessions using the Analytics API. To enable the capture of the lifecycle events, it must be initialized in the native platform of the Cordova app. Open the [Cordova application root folder] → platforms → ios → Classes folder and find the AppDelegate.m (Objective-C) or AppDelegate.swift (Swift) file. Follow the iOS guide below to enable or disable LIFECYCLE activities. Build the Cordova project by running the command: cordova build. Open the [Cordova application root folder] → platforms → android → src → com → sample → [app-name] → MainActivity.java file. Look for the onCreate method and follow the Android guide below to enable or disable LIFECYCLE activities. The client collects information such as roundtrip time and payload size when you start collecting on the NETWORK device event. The server collects back-end information such as server processing time, adapter usage, used procedures. Because the client and the server each collect their own information, charts do not display data until the client is configured to do so. To configure your client, you need to start collecting for the NETWORK device event and send it to the server. To enable the capture of the network events, it must be initialized in the native platform of the Cordova app. Open the [Cordova application root folder] → platforms → ios → Classes folder and find the AppDelegate.m (Objective-C) or AppDelegate.swift file. Follow the iOS guide below to enable or disable NETWORK activities. For the Android platform: navigate to the subactivity of the main activity to disable. Open the [Cordova application root folder] → platforms → ios → src → com → sample → [app-name] → MainActivity.java file. Look for the onCreate method and follow the Android guide below to enable or disable NETWORK activities. Use the following API methods to create custom events. For the web API, custom data is sent with the addEvent method. There is no unsetUserContext in the MobileFirst Web SDK. The user session ends after 30 minutes of inactivity, unless another call is made to ibmmfpfanalytics.setUserContext(user). Sending Analytics is a crucial step to see client-side analytics on the Analytics Server. When data for the configured event types is collected for Analytics, the analytics logs are stored in a log file on the client device. The data from the file is sent to the MobileFirst Analytics Server by using send method of the Analytics API. Consider sending the captured logs periodically to the server. Sending data at regular intervals ensures that you will see up-to-date analytic data in the MobileFirst Analytics Console.